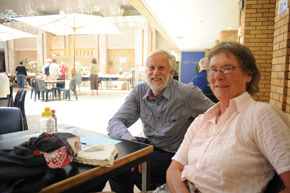 For Dave and Fay Jones, attending UCT’s Summer School lectures is like listening to music. “You either enjoy good music, or fall asleep if it’s boring,” Dave quipped. But the couple from Sedgefield in the Southern Cape was quick to point out that Summer School has always been “stimulating”. This is why they’ve not missed even a year over the past decade. Stimulated: Dave and Fay Jones are among the thousands of people who are attending this year’s Summer School. Summer learning: About 2 500 people are expected to attend this year’s Summer School. Joining 2 234 other students at the 62nd Summer School edition (organisers expected the number to rise to about 2 500), which runs from 17 to 28 January, the couple praised the high standard of both the lectures and the organisation. 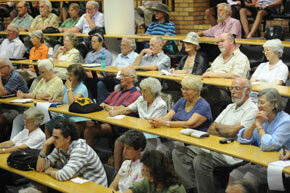 The classes may even be better than when they were UCT students in the early 1960s, they thought. The Joneses added that they always find interesting courses to do. “These courses always give you a different slant on issues, and the nice thing is that there are no exams,” Fay quipped. Summer School, which moved to a new venue in Kramer Building, has something for everyone in its chock-a-block menu of 59 courses. These range from programmes on stem cell research and the Anglo Boer War, Afghanistan, and Hollywood child stars, to courses on the representation of parents and children in 19th century fiction and practical language learning. The programme comprises lecture series (two to five lectures over several days), lunch-time talks (one-hour lectures), practical courses (a number of two- to three-hour sessions in art, writing, social media and maths) and introductory courses in isiXhosa, Italian and Mandarin. These programmes are presented by top local and international experts, including the respected judge Dennis Davis, retired US physicist Emeritus Professor David Wolfe, and Dr Robin Catchpole, a UK astronomer.